Family therapy or family counseling is designed to address specific issues that affect the psychological health of the family, such as major life transitions or mental health conditions. It may be used as the primary mode of treatment or as a complementary approach. Families can benefit from therapy when they experience any stressful event that may strain family relationships, such as financial hardship, divorce, or the death of a loved one. In addition, it can be effective in treating mental health concerns that impact the family as a whole, such as depression, substance abuse, chronic illness, and food issues, or everyday concerns, like communication problems, interpersonal conflict, or behavioral problems in children and adolescents. Family counseling aims to promote understanding and collaboration among family members in order to solve the problems of one or more individuals. For example, if a child is having social and academic problems, therapy will focus on the family patterns that may contribute to the child's acting out, rather than evaluating the child's behavior alone. As the family uncovers the source of the problem, they can learn to support the child and other family members and work proactively on minimizing or altering the conditions that contribute to the child's unwanted behavior. Family counseling is provided by licensed marriage and family therapists (LMFT). Other mental health professionals—such as professional counselors, social workers, and psychologists—who have received formal training in family therapy approaches may incorporate those principles into their own work. This mode of therapy is solution-focused and short-term, with as few as nine sessions required, on average. Meetings are often held once per week and typically last for 50 minutes. The number of family members who attend each session may vary, depending on therapy goals, and often a therapist will offer individual sessions to supplement the family sessions. Family counseling is conducted in a variety of settings including family counseling services, community agencies, and residential treatment centers. Most forms of family counseling borrow heavily from systems theory, though there are others based on psychological approaches such as experiential, cognitive-behavioral, and psychodynamic. Family systems therapy contends that the internal dynamics of the family system can produce and sustain problematic behaviors in family members. 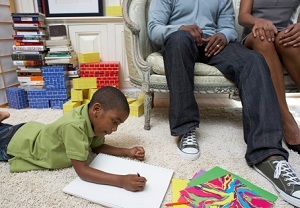 All family therapy approaches are designed to help families improve communication, problem-solving, and coping skills, and enhance their sense of connection to one another. Elements of family therapy can be found in the family-focused social work of the early 20th century and the work of child psychoanalysts, such as Nathan Ackerman, in the 1930s. But it wasn't until the late 1950s that family therapy was developed in earnest, as many psychiatrists and psychoanalysts—including Virginia Satir, Murray Bowen, Milton Erickson, and Jay Haley—were seeking a novel, alternative approach to traditional individual therapy. Family therapy was formally accepted in the psychotherapeutic community in the 1960s and has continued to evolve over the years.